Medication can provide relief from migraines but there are also a range of complementary and alternative therapies which can help alleviate symptoms in a natural and holistic way. Acupuncture in particular is a popular choice among migraine sufferers. “In Chinese medicine we see any symptoms as a sign of imbalance and migraines are no different. Quite often they will tie in with other health issues which may not seem connected to the patient. Chinese acupuncture refers to a system of healing that originates from China and the Far East. It has been practised for thousands of years and is based on the philosophy that good health is determined by the smooth flow of our body’s energy (Qi). The therapy involves the insertion of fine needles into specific meridian/pressure points on the body to address energy imbalances and areas of tension and pain to return the body to a state of balance and health. As Ian explains, acupuncturists treat patients as a whole rather than focusing on their specific ailments. This means treatment may involve addressing other aspects of a person’s well-being. “Dietary and lifestyle advice is an important aspect of treatment, and the practitioner will guide a patient to make changes that are appropriate to them,” Ian says. Typically around four to six acupuncture sessions are needed for a patient to start seeing positive effects, and Ian adds that most people respond well to treatment. “From my experience I have found that most migraine sufferers experience an improvement quite quickly. Most find that their migraines become less severe and far less frequent. 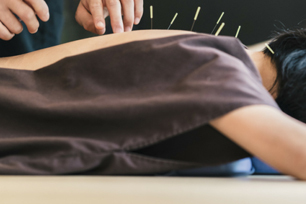 If you are keen to take a more natural and holistic approach to your health, you can find information on a range of complementary and alternative therapies, including acupuncture, on our therapy topics page. Please remember you are advised to speak to your GP before considering complementary or alternative therapies to help with any symptoms.